Since moving to my new apartment the summer has now brought a different problem. How should I be keeping cats cool when the outside temperatures are increasing. Whilst us humans can find somewhere shady to sit or drink colder water or even wear lighter clothing, cats have it a bit trickier. Having a thick fur coat will mean that your cat will feel hot and if they are indoor cats only then the available shady places might seem limited. We all think that cats absolutely love the heat, after all in the wild cats are used to hot weather. But over the decades we have domesticated cats and they no longer resemble their compatriates in the wild. Also, cats have been bred for maybe longer fur coats or different shaped faces and all of these can have an impact on how they handle hot weather. 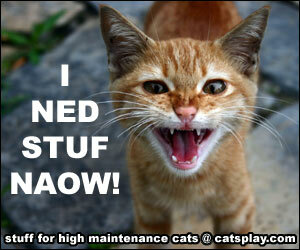 Plus our cats can be used to an indoor environment where the temperature is pretty stable. So when the temperature suddenly rises they might not be completely happy. My cat Dyson is definitely not a happy kitty in hot weather and she gets distinctly grumpy. As she has a very thick fur coat and while cats do have sweat glands in their bodies it is often difficult to sweat through thick fur. Usually, heat is only lost through paws and this is a very small area. Now also with a kitten coming into her first summer, I am having to think of extra ways of keeping my cats cool especially when I am not home during the day. If you have a lot of windows in your house/apartment then it can get very hot during the day. Instead, keep the blinds or curtains drawn in at least one room to make a cool shady area. You will probably find that your cat will enjoy stretching out full length in this shadier area. Stretching their bodies out on a cooler surface will help them cool down. Basements are usually much cooler than the rest of the house and therefore if you have cats and dogs they may prefer to spend the hottest part of the day in the basement. If you do not have a basement, then a tiled or wooden floor also works well. You may also find that your cat enjoys stretching out in the sink or bath during the hottest days (preferably when not filled with water). Your cat needs to remain hydrated during hot weather as this helps keep heat stroke at bay. Therefore, make sure that you leave out plenty of bowls of fresh cool water. 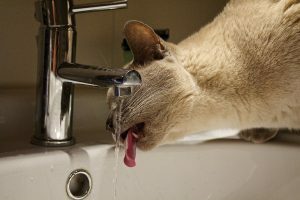 If you use a water fountain for your cat then this is even better as they keep the water cooler and fresher for longer. Another tip is to place a few ice cubes into the water to help keep it cool. Usually, I keep a jug of filtered water in the fridge and top up the water fountain using this. It may seem simple to just open some windows but this can often have a distinct cooling effect on your house or apartment. Especially if there is a slight breeze. However, if you have indoor cats there is the risk that they can get out. This is especially dangerous if you are near to a busy road or have an apartment on a higher floor. Sometimes windows on higher levels do have special catches to stop the window opening too far. Otherwise, you can get screens that fit onto the window. 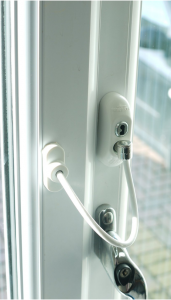 However, last year I thought of a cheaper and less intrusive version – child safety locks. These are designed to stop children being able to push open the windows and therefore from falling out. And if they are able to cope with a heavier child then they will stop cats from opening the window. I found that they could allow the window to open about 4 inches which might seem a little wide, especially for a small cat. Therefore, I have placed mine at an angle so the window only opens about 2-3 inches. They were also easy to fit as I am not the best person at DIY and I can unlock them if I want to open the window all the way. 5. Put on a Fan or Air Conditioner. If you have an air conditioner then put it on as your cat will appreciate it. If not then the breeze from a fan blowing over kitty’s fur will give them some relief from the hot weather. However, do be careful because if you are using a floor fan then cats can put their paws into the blades which can cause catastrophic injuries. Instead, try a taller fan or even bladeless fans are now increasing in popularity. A couple of tips for fan use which will help both you and your cat are to place it nearer an open window so it will circulate the cooler air from outside further into the room. And to make the air much cooler you can place a large bowl of ice in front of the fan. It really does give a nice cold breeze. Ice balloons can be both useful and a little amusing when it is hot and you want to cool down your cat. Just fill up a balloon with water and leave it overnight in the freezer. The following day you should have a ball of ice. Now just remove the balloon and place the ball into a dish. As the ice melts it will provide cold water for your cat. 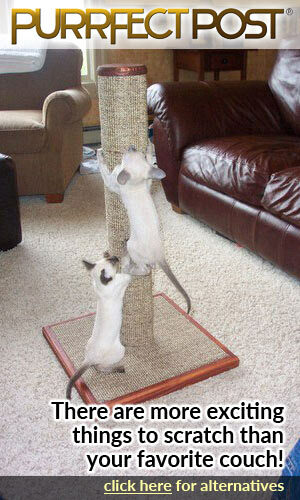 Plus some cats find some entertainment in pushing the ball around a little. You can even place the ice ball in front of your fan for a little bit of extra cooling. You may have noticed that your cat seems to groom themselves a lot more during the hot weather. This is because saliva is then distributed over the fur and has a cooling effect. You can mimic this action by taking a damp cloth and gently wiping it over your cat’s fur. Just smooth the cloth gently over the cat from the head over the back and down to the tail. Whilst most cats do not like getting wet they might appreciate the extra cooling on hot days. If your cat loves water and does not mind being bathed then you can also give them a cool bath. Do not do this though if your cat is not used to bathing as it can stress them even more. Though cats love running around and playing it is probably best to just let them rest when it is so hot. 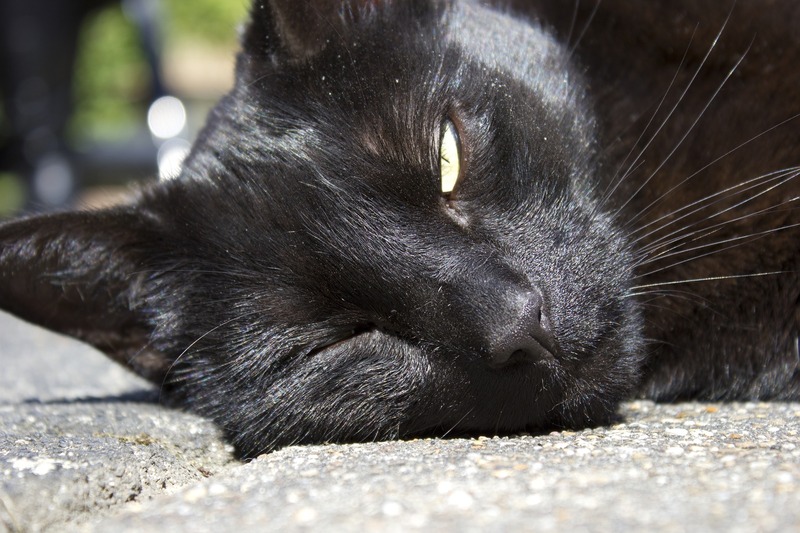 Strenuous exercise can help to over-heat your cat on a hot day. It is not a good idea to allow your cat to access human gel packs. Even though these can be cold, they are not designed to withstand cat’s claws and so can release toxic chemicals over your cat’s fur. However, a number of pet manufacturers have created pet cooling mats which activate when your pet sits or lies on them. 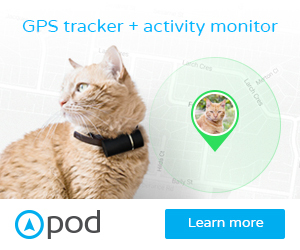 Usually, they are designed for dogs but are also great for cats. And as they are made especially for pets then they will withstand claws. 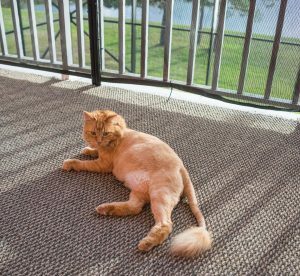 If your cat has long fur you can get a kitty hair cut – such as a lion cut. 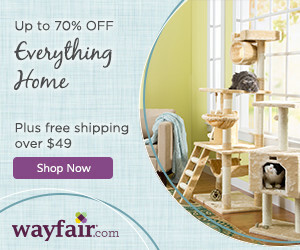 This can also stop fur matting which also can heat up your cat more. Again though only do this if you know you are not going to stress out your cat. But you can also get a hygiene cut from your local vet or even a pet groomers. But be careful with paler furred cats as they have very pale skin and can be prone to sunburn which can lead to skin cancers. For pale cats, you can put sunblock on their ears and keep them indoors during the hottest part of the day. One thing though you should always bear in mind is to never ever leave your cat in a car. Even leaving a pet inside an enclosed car for just five minutes will allow the temperature inside to shoot up. It does not take very long at all for the temperature to top over 100 degrees and even leaving the window open a couple of inches is going to make no difference to the temperature. Cats and dogs have very very quickly become distressed and died in hot cars. If you are travelling by car through during hot weather it is probably best to leave your cat at home. If you do have t take your cat with you then make sure that your car air conditioner is on and blowing towards your cat carrier. Sometimes the air con blows in the front of the car only and the back seats can get very warm. Also, most cat carriers are too enclosed to let a lot of air through so make sure you get a carrier which has a lot of air vents. If you are travelling for a distance then make sure to take plenty of fresh water for your cat to drink and also take rest stops in shady areas frequently. Excessive panting – while dogs often pant in the heat, cats do not. Therefore, if your cat is panting this can be a sign of stress so immediately move your cat to a cooler area and try and cool them down with a damp cloth. If you see any of these signs then take your cat immediately to a veterinarian. If you can, use the damp cloth trick as well to try and cool down your cat but it is important to get quick treatment. Heat stroke in cats can be lethal as they could suffer from organ failure, brain swelling etc. Useful and informative post on how to keep cats cool in summer. Tips here can be used for dogs as well. Would definitely bookmarked this page and show it to friends who has dogs or cats as pets, as the country I live in currently is hot all year around these tips will definitely come in handy. 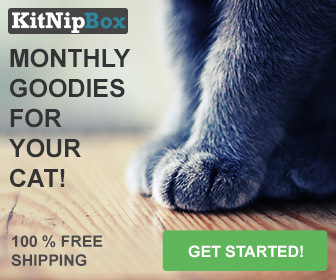 How about another post on how to keep cats warm in cold weather? Cheers! Thanks very much for stopping by. Yes a lot of these tips you can use for dogs – especially not keeping them in cars during hot weather. Thanks for the idea for another post. I really love the obvious care you have for cats. In Queensland, Australia, it can get quite hot in the summer and a lot of pets in general struggle with the heat. I would really recommend getting a water fountain for your cat despite the heat, usually they prefer it over a bowl of water. How effective is freezing a balloon full of water and freezing it in comparison? I thought that maybe the water might be too cold and give them brain freeze? These are some great tips for keeping you cat cool in the warm summer months. I especially like the idea of putting a balloon filled with water in the freezer. I would have never thought of that! I will try these things with my kitty and hopefully he will stay cool! Do you have suggestions for how to keep them warm in the winter time? Aww – yes getting a cut can make some long haired cats feel happier. Though some do not like going to the groomers so you found a good compromise. My ragdoll’s fur is pretty silky so does not really matt but a previous cat I had, had very thick long fur and it always used to matt so needed trimming (she hated being groomed). You wrote a very helpful simple article, thank you! I live in Bahrain so the weather is very hit and humid 80% of the year. Our cat lives indoor ofcourse but she usually thinks twice before going to the balcony to use her litter box haha. Thankfully most apartments here have a central AC, so the temp is always between 20-22 Celsius and my cat loves it like that. thanks for your tips. I actually never knew that they lost heat through their paws. I learned something today. A basement is a great place for them to cool off and out Boots go there when he gets all hot and bothered. Another thing he’ll do is climb up on inside window ledge and press his body up against the glass to cool off. All of your suggestions are great and I thank you for sharing them.